Bank tellers, factory workers, grocery store clerks, fast-food workers, toll booth operators, truck drivers... These are just a few of the jobs that have been taken over by artificial intelligence. 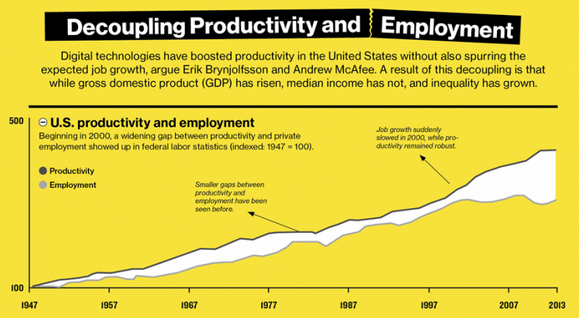 The effects have been most apparent in the manufacturing industry, where productivity has increased, even as jobs have disappeared. Some 22 million manufacturing jobs were lost globally between 1995 and 2002, even as industrial output soared 30% due to technological advances. I'm not just talking about the United States, either. Manufacturing jobs in Japan and Germany have been dwindling since 1990. Even manufacturing in China has trended downward since 1996. Foxconn, the notorious Chinese electronics manufacturer responsible for your iPhone, recently announced that it'd automated away 60,000 jobs in just one of its factories. One factory has "reduced employee strength from 110,000 to 50,000 thanks to the introduction of robots," a government official triumphantly told the South China Morning Post. Meanwhile, back home, business titans are threatening to cut more jobs if the government raises the minimum wage. "It's cheaper to buy a $35,000 robotic arm than it is to hire an employee who is inefficient, making $15 an hour bagging French fries," former McDonald's chief executive Ed Rensi told Fox Business. Of course, AI will take over regardless of whether or not the minimum wage goes up. It's already happening. The federal minimum wage, adjusted for inflation, is lower today than it was in 1950. That hasn't stopped Wendy's from deploying AI anyway. Dave Thomas's burger joint is replacing cashiers with touch-screen kiosks where patrons can order food and pay. One worker at a Chicago Wendy's said the move would eliminate five jobs from the location. McDonald's has kicked off a machine-ordering pilot, as well. And White Castle has been testing order and check out kiosks for the last two years. Automated customer service reps have been answering phones for years. Grocery stores have increased the number of self-checkout aisles. And toll booth operators are being replaced by EZ Pass. Now the obvious question is: If robots are taking our jobs, how can we make money? Well, one solution would be to invest in the companies that are making the machines. That's why we've written this report. These stocks are the ones that have the most to gain from the robot revolution. 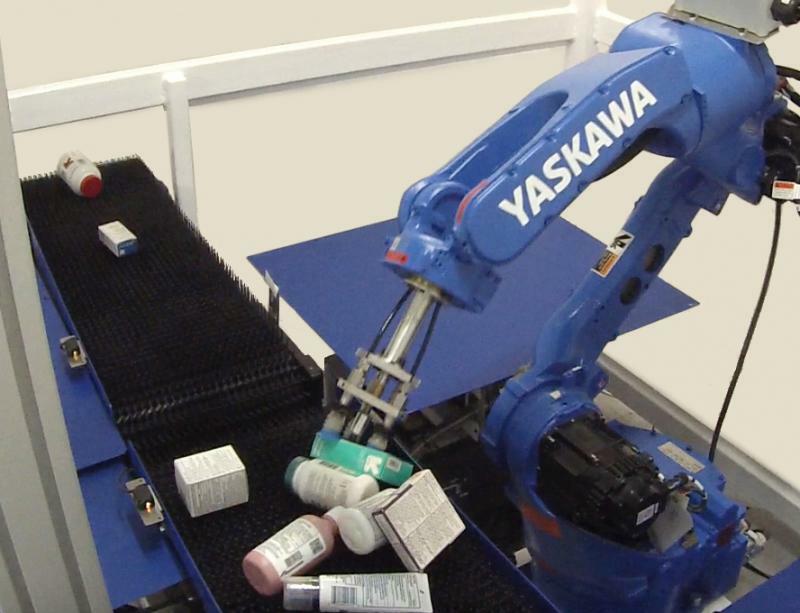 Japan-based Yaskawa Electric (OTC: YASKY) is a global leader in industrial robotics. With a $3.4 billion market cap, Yaskawa controls roughly 20%, or one-fifth, of the world market. Its machines perform such jobs as arc welding, packaging, coating, and assembly. One of its newest products, the RX Unit Pick Workcell, is a fully automated robotic pharmacy order fulfillment system. It can handle thousands of different kinds of prepackaged medicine for mail-order delivery direct to customers or pharmacies. It recognizes and identifies thousands of different kinds of medicine bottles, tubes of ointment, small cartons, and odd-shaped plastic containers. It reads each unique National Drug Code (NDC), orients the medication, and identifies a safe labeling zone for adhering a patient label. This is a good business. Prescription drug fulfillment volume is rapidly increasing. Some 1.3 billion pre-packaged prescriptions are delivered in the U.S. each year. That represents 30% of the total 4.3 billion medical prescriptions dispensed. Yaskawa has increased sales in each of the past five years, and it continues to demonstrate consistent growth. NCR Corp. (NYSE: NCR) leads the world in self-checkout and electronic point-of-sale technologies. NCR products include the self-checkout machines in grocery stores, restaurants, and retail outlets, self-service kiosks at airports, and ATM machines. NCR enables 760 million transactions daily across financial, retail, hospitality, travel, telecom and technology industries. The company has 34,000 employees across 180 countries and had about $6.5 billion in revenue last year, putting it at No. 432 on the Fortune 500 list. The average cost of a self checkout machine is $20,000. That's barely more than the average retail wage before payroll taxes, so retailers recover savings in just about a year after purchase. NCR also offers a vast array of self-service software, including bar code scanners, and check and document imaging for banks. In fact, in recent years, the company has shifted its business model to focus more on software and cloud solutions, which have higher margins. And last year, the company acquired payment processing, payroll management and human resources company JetPay for $184 million. NCR plans to integrate JetPay’s cloud-based payments platform into its self-service kiosks and other point-of-sale solutions for the retail and hospitality industries. NCR is heavily invested in research and development. The company has spent nearly $700 million on R&D in the past three years, and it owns approximately 1,450 patents in the U.S. alone. We've seen a lot of disruptive technologies in the past few years — streaming services, mobile apps, and more. But automated vehicles (AVs) will shift tectonics more than anything we've seen recently. This trend is television-big. It's going to transform America. The driverless car market is expected to be worth $42 billion by 2025. And by 2035, IHS Automotive estimates that 10% of light vehicles sold will be completely driverless. But long before the average American is being chauffeured around by a robot, self-driving cars will be taking over for trucking and delivery companies. It's already happening. And for good reason. There are currently 848,640 drivers employed in the trucking industry — and that's with a labor shortage. Replacing them with automated vehicles (AVs) would not only be cheaper, but safer too. 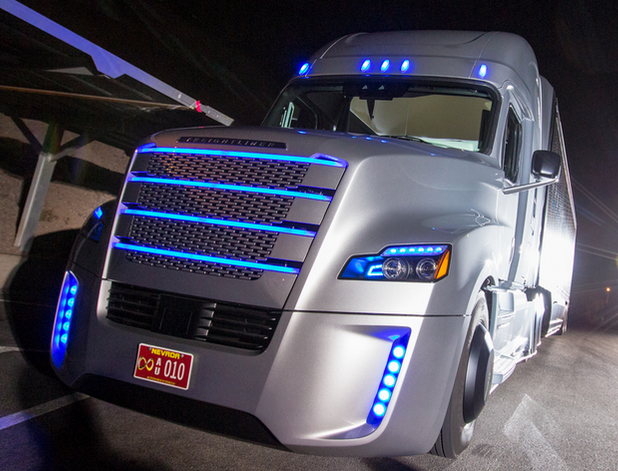 According to McKinsey & Co., switching to AVs would save the trucking industry $190 billion annually. Furthermore, multiple studies suggest it would reduce trucking accidents by 90%. No doubt, AVs are the future and there's no shortage of companies working on them. Google (NASDAQ: GOOG) is perhaps the most prominent name in this fledgling industry. Google's testing fleet of 58 AVs has traveled more than 1.5 million miles throughout the western United States since the company started its program in 2009. However, the company is determined to perfect its technology, and build a completely new driving experience before taking its cars public. There is no time table on when Google's self-driving cars will be made available for retail. Ford (NYSE: F), Daimler AG (OTC: DDAIY), Audi (OTC: AUDVF) and just about every other major car manufacturer are competing in the space, as well. At this early stage, it's impossible to tell which company will reach the finish line first, or meet with the most success. The only sure-fire winner is the trucking industry as a whole. Indeed, labor is one of trucking’s highest expenses . The supply of qualified drivers is limited, and companies need to offer high wages, pensions, and workers’ compensation to lure candidates. AVs are also more fuel efficient than traditional cars and trucks. That's just as important because fuel accounts for 30-40% of trucking costs. These savings are why high upfront cost to transition a fleet, and a major fight from the truckers' union, will fail to stop the industry from evolving. J.B. Hunt (NASDAQ: JBHT) is the third-biggest trucking company in the country, behind UPS (NYSE: UPS) and FedEx (NYSE: FDX). The company owns 12,500 tractors, more than 29,000 trailers, 79,000 containers, and 68,000 chassis. J.B. Hunt also owns or leases 42 terminal facilities, 89 Final Mile Services cross-dock locations, 34 ICS branch sales offices, and other support locations across the USA, Canada, and Mexico. J.B. Hunt reported a 19% in annual revenue last year, raking in $8.6 billion. Net income came in at $490 million. Electronic parts suppliers will also benefit from the transition to AVs. According to analysis firm IHS Technology, micro-controller and processor units for AVs will be a half-billion-dollar market by 2020, up 625% from $69 million in 2013. NXP Semiconductors (NASDAQ: NXPI) is a leader in this field. It's #1 in the identification industry, supporting bank cards, e-government solutions, and mobile NFC. And 41% of NXP's sales come from the automotive sector, making it the largest automotive computing player by a wide margin. In that arena, its products facilitate microcontrollers, in-vehicle networking, entertainment systems, secure car access, and automotive safety features. It does just as much in homes and office buildings too, connecting, processing, and enabling smart grids and appliances. The company reported strong results in 2018, delivering earnings per share of $6.78, up from $6.72 in 2017.
iRobot (NASDAQ: IRBT) is the maker of the ubiquitous Roomba self-directed vacuum, which dominates the home robot market. But that's not all. The company is now moving outside the home. Its new automated lawnmower was just cleared by the FCC. The mower will use transmitters fitted into the ground to navigate the outdoors. In addition to these two bellwether products, iRobot makes automated floor scrubbers, mops, and pool and gutter cleaners. A little-known fact is that the company also made security robots for the U.S. military. However, it recently sold that division off to Arlington Capital Partners for roughly $45 million. 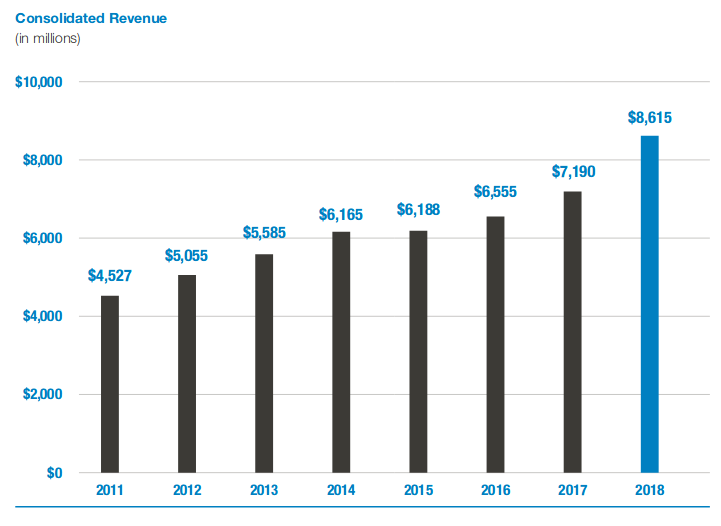 As a result, iRobot can focus exclusively on home robots, where it generates the bulk of its revenue. This trend should continue as iRobot dominates this decidedly niche segment with a 90% share of the U.S. market, and more than two-thirds globally. Its nearest competitors absorb less than 10%. As a result, iRobot is poised for high growth for years to come, as the home robotics market grows. One of the most important roles of robots is that of replacing soldiers on the battlefield. The U.S. military could have more robot soldiers on the battlefield than real ones as soon as 2025. To that end, AeroVironment (Nasdaq: AVAV), the Pentagon’s top supplier of small drones, is a must-own stock. AVAV's models include the Raven, Wasp, and Puma. All of these drones provide live video and other valuable information to hand-held, ground control systems (GCS), giving soldiers on the ground real-time tactical reconnaissance, tracking, combat assessment, and geographic data. The Raven is the most widely used unmanned aircraft system in the world today. With a wingspan of 4.5 feet and a weight of 4.2lbs, the Raven can be deployed by hand. The Wasp is even smaller, weighing just 2.85lbs with a 3.3 foot wingspan. And the Puma is a little bigger than both, but has the capability of being able to land on water. It also has a broader range and longer-lasting battery. Beyond that, AVAV makes even smaller, expendable drones – small enough to fit in a soldier’s rucksack – that can be deployed tactically. That includes the Switchblade, which is essentially a precision-guided grenade, or hand-held missile. As a recent demonstration showed, the Switchblade can work in tandem with the Puma, with the Puma providing recon and targeting info, and the Switchblade swooping in to neutralize the threat. This communication is called “sensor-to-shooter” and reduces the burden on the drone operators. 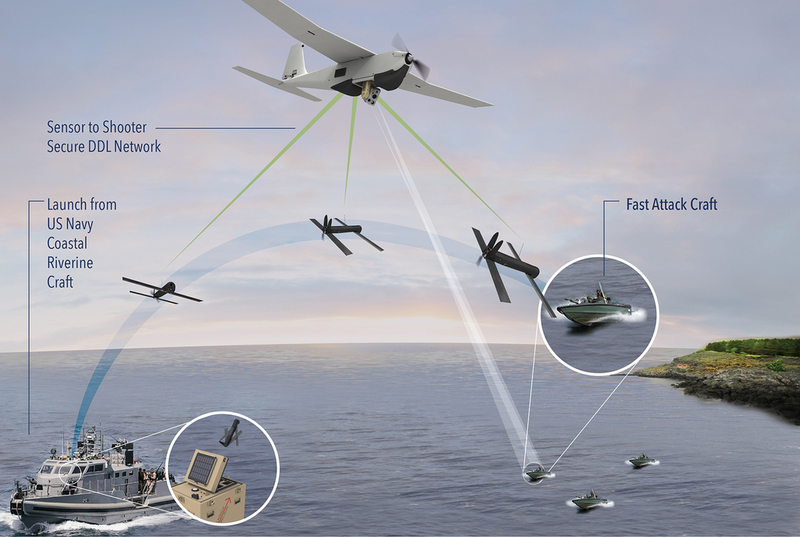 Small, efficient and lethal AeroVironment drones have become a key to military arsenals. But that’s not all the company does. It’s equally important to note AVAV’s electrical vehicle segment. You see, in addition to manufacturing war machines, AVAV also makes charging stations for electric vehicles. This includes home charging stations for Ford, Volvo, Nissan, KIA, Chevy, BMW, Mercedes, Toyota, Tesla, and others. This is a tremendous growth market as EV demand is soaring. EVs are expected to take over a fifth of the auto market by 2035. And by 2040, more than a third of the world’s cars will be electric. Eventually, gas will be replaced altogether. That puts AeroVironment smack dab in the middle two major growth industries. Perhaps that’s why its net income rose 332% from 2015 to 2017. It also maintains little debt and strong cash flow. With strong sales growth and government spending picking up, the stock is likely to enjoy a nice tailwind in the years ahead, perhaps even doubling in value. In any case, the role of robots and AI today is rapidly increasing in all facets of life. And all of the companies we talked about here will benefit greatly.